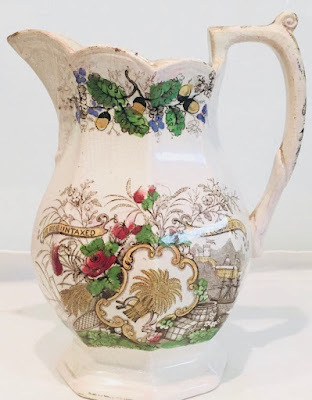 Everard, Colclough & Townsend (1837-1845) "Plenty" jug. I've been watching "Victoria" on PBS. 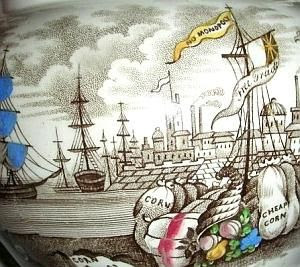 A few episodes deal with the the need to repeal the Corn Laws that made it so expensive for the common working people to buy food (grain for bread). The laws, passed in 1815, were meant to protect the price of grain (corn) from the competition of foreign markets. However, the laws created a monopoly that enriched the landowners. This worked until 1845 when the potato blight in Ireland, poor harvests in England, plus the high cost of grain created a famine in Ireland and near famine in England. I have often wondered about transferware patterns that feature the words "Corn Laws" and "Free Trade." I knew nothing about these laws, nor their consequences (or forgot). * Once again, the study of transferware patterns has opened a window onto history. One of the things I learned is the word "corn" refers to wheat, rye, and other grains, not just what Americans think of as corn. Another is that one of the biggest motivating features of politics is greed (I actually knew this already). And yet another is that free trade can both benefit and destroy. 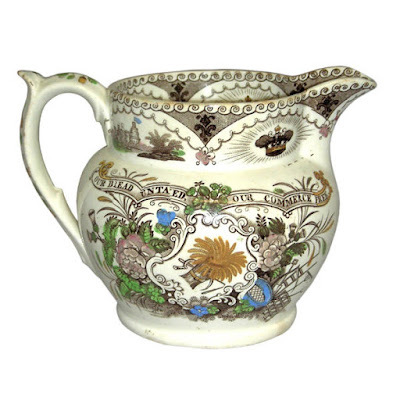 The Corn Laws were more complicated than I am telling you, so I suggest you look at the link above. Here is a close-up of the photo above. The flags say "Free Trade" and "No Monopoly." The bags are easier to read: "Corn" and "Cheap Corn." 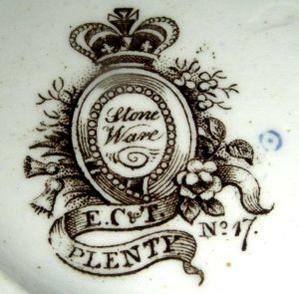 The mark for the above teapot. 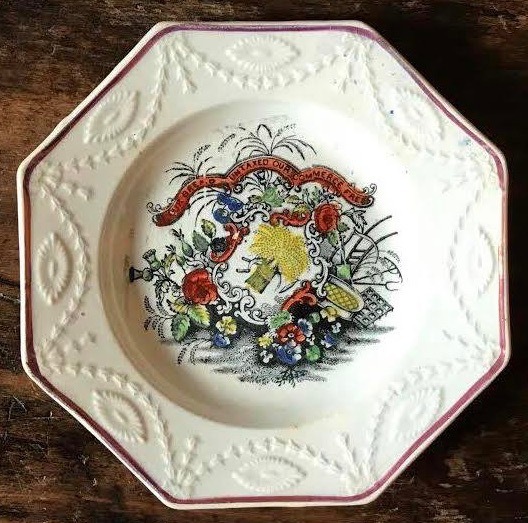 A child's plate with the same pattern as the above jug. 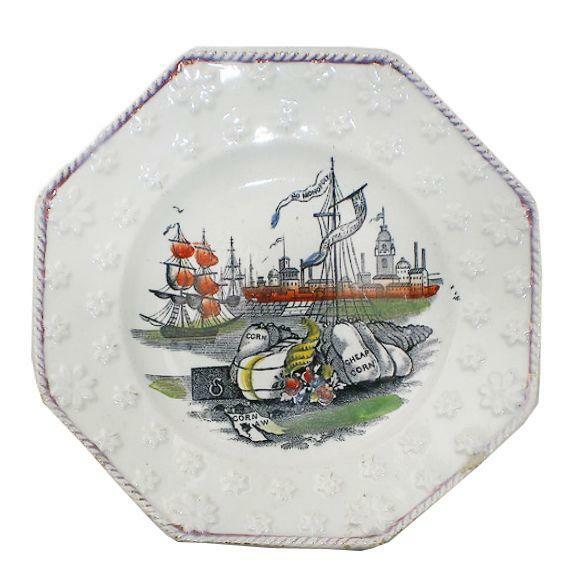 Child's plate with the caption "Our Bread Untaxed Our Commerce Free." This was the motto of the Anti-Corn Law League. The pattern is the same or nearly the same as one side of the "Plenty" jug. A jug with the same pattern or a similar pattern to the plate above. The Corn Laws were repealed in 1846, but not before many people died of starvation. Just one more pattern to show that the Potteries wanted Free Trade too, although Free Trade may have helped the demise of the Staffordshire pottery industry at the beginning of the 21st century. I may only be surmising, so please let me know what you think. 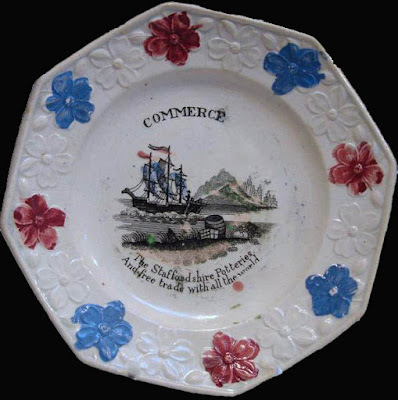 Child's plate "Commerce/The Staffordshire Potteries/And free trade with all the world." I'll end with pointing out that free trade remains an issue today. Just read the newspaper! *And one more thing. 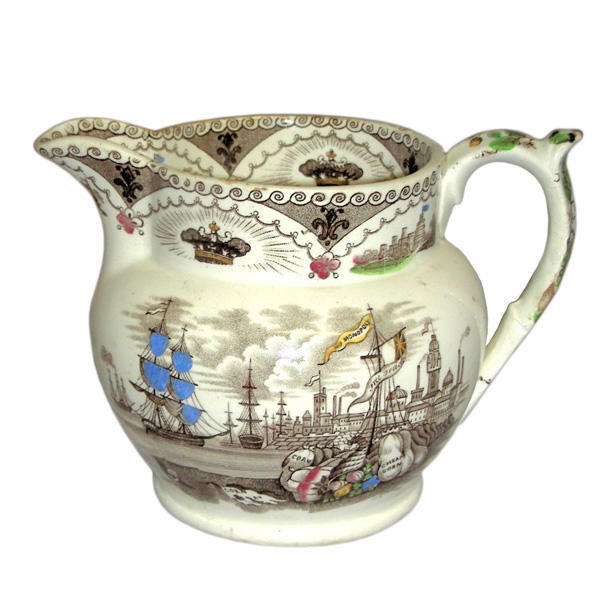 If you are a Transferware Collectors Club member, see the excellent article written by Michael Weinberg titled "British History by the Jug" in the Spring-Summer 2010 Bulletin, pp. 4 and 5.